If you are looking for IVF in Essex it is now easier to compare clinics on the HFEA website. Clinics present their success rates in different ways and this can be misleading, as the chance of IVF success depends on the age of the patients, type of infertility and their medical history. Also the statistics can be confusing if the clinic has only treated a few patients. The HFEA has changed the way it presents data so that patients have more context in which to make choices. It is also objective as it insists that clinics present their data in a consistent format. To give a taste of how the data is presented we have chosen two Essex IVF clinics and have selected ‘live births per cycle’ as an example – after all, having a baby is what you want to achieve. In the diagram below you can see from the circle that 196 women had a baby following treatment at Bourn Hall Fertility Clinic in Colchester – this refers to women of all ages treated within a three year period. The success rate is 26% for all patients, of all ages, which is above the national live birth rate. However, you will want to know if this is a good result, so the HFEA gives a graphic that compares the clinic result (in orange) to the national average (in green). If the success rates for the clinic are above the national average then the clinic line is to the right of the national average. The yellow shading shows how confident the HFEA is that the results are reproducible. 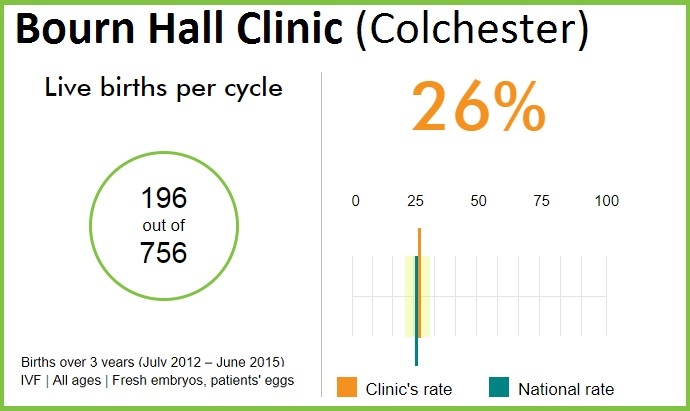 If you compare Bourn Hall Clinic Colchester to Brentwood Fertility Centre you see that Bourn Hall (above – click image to view full HFEA statistics) has many more cycles and so the results are unlikely to vary much (if there are, for example, two more births a year). The narrower the strip, the greater the confidence. 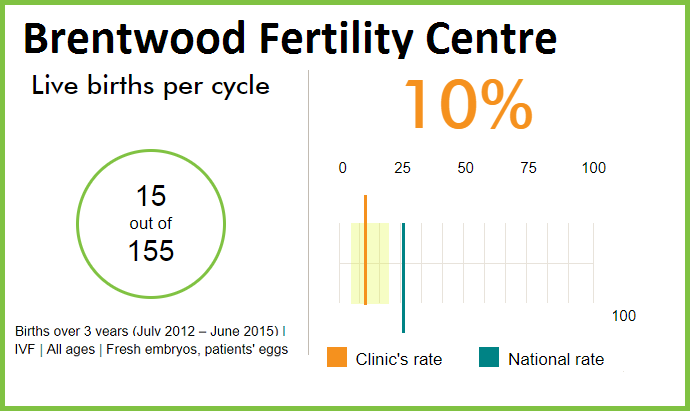 The success rate for Brentwood Fertility Centre is 10%, which is well below the national average of 25% (above – click image to see full HFEA statistics); with an average of 5 births a year (15 in the last three years), if next year this increases to 7 or it drops to 3, that would have a big impact on its success rate. So the shaded block is wider for this clinic. 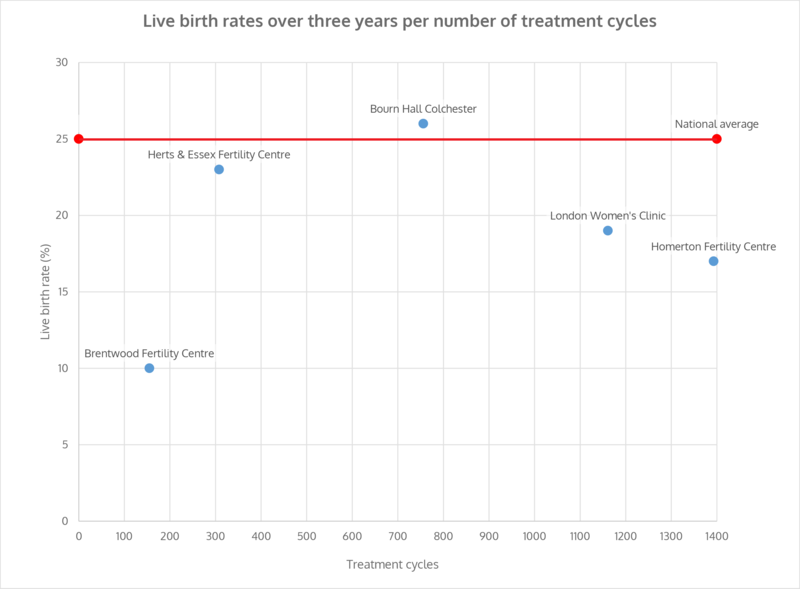 Another clinic, London Women’s Clinic, has had 1161 treatment cycles in 3 years with 224 live births – this is a 19% success rate. So out of 100 women having treatment only 19 will have a baby. The Herts and Essex Fertility Centre is better with 308 cycles, 70 babies and a 23% success rate. Simply Fertility has no results yet on the HFEA website as the clinic is too new to have HFEA published data. Other factors to look for include success with frozen embryo transfer and multiple birth rates. The birth rate per cycle will be higher if two embryos are routinely transferred, but twin pregnancies have more complications for mothers and their babies so government policy is to restrict the number of embryos transferred. Clinics that provide NHS funded treatment tend to have a lower multiple birth rate; it is 14% for Bourn Hall, which is the national average. Other clinics are less reserved and may transfer two or more embryos, such as the Assisted Reproduction and Gynaecology Centre which has a much higher multiple birth rate. The HFEA website is still quite new and it will take time for people to start leaving reviews, but we have been delighted to receive good reviews on Facebook and now see them beginning to appear on the HFEA website too. If you would like to, you can leave a review for our Cambridge, Colchester and Norwich clinics. IVF in Essex Bourn Hall Colchester and the new clinic in Wickford have regular open evenings. More information here. To view full statistics for a clinic, select ‘choose a clinic’ , put in your location (eg. Chelmsford) or start typing the name of the clinic if you know it, then click the clinic. On the clinic page, scroll down to the bottom of a section in ‘What are the clinic’s statistics?’, click ‘view detailed statistics’ and choose your parameters (time period, treatment, age, own or donated gametes). The graphics above show results for births for the period July 2012 – June 2015, resulting from IVF treatment of patients of all ages using fresh embryos from patients’ own eggs (except for Bourn Hall in Norwich, which is for the period July 2014 – June 2015 as the clinic only opened in 2013).